The ss Umhlali was a 3,388 ton steamer, Built in 1904 and commanded by Captain J.L. Richards. This wreck happened 6 weeks later than the Maori on 15th September 1909. She struck Albatross rock at 22h30 when most of the passengers were asleep, and within 5 minutes her engine room was flooded. Captain Richards who should have been on the bridge was in the smoking room playing cards. Passengers rushed to the deck and poured into the smoking room. The seamen managed to launch the six lifeboats. One lifeboat capsized in the dark and the occupants were flung into the water only to be saved by the crew of the captain's lifeboat who also managed to right the capsized lifeboat. Sadly Mrs Harrison holding her three year-old son lost control of him in the incident and despite rescue attempts by the crew, he disappeared below the surface and drowned. One lifeboat was assisted by local fishermen who guided them to Kommetjie beach. The remaining five lifeboats rowed all night in the direction of Cape Town. Four lifeboats were picked by the Galeka and the fifth by the tug Falla. 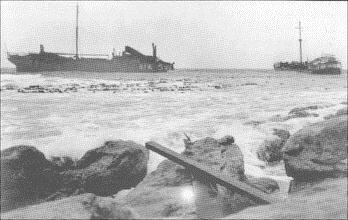 The Swedish freighter the 3,344 ton Bia built in 1905 had a crew of 32 and met with a different fate. She struck Albatross Rock at 21h30 on 18 September 1917. They mistook the old Cape Point light for a steamer which caused them to head straight for the rocks and run aground. News of her grounding reached Simon's Town and three ships were sent, and took off the Second Officer with the ship's papers. The remainder of the officers and crew refused to leave the stranded vessel. During the night the swell increased dramatically. The next morning, two of the lifeboats cast off, but before they could reach the rescue vessels, one of the boats capsized and three men drowned. The remaining 14 crew-members on board the Bia had to use a rocket-line fired from Clara (one of the rescue vessels). 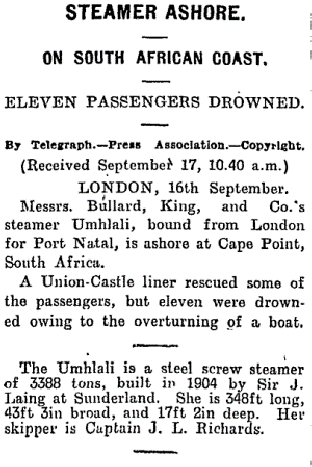 FINDING of a Court of Inquiry held at Cape Town on the 23rd, 24th, 25th, and 27th days of September, 1909, into the circumstances attending the stranding and loss of the British steamship "UMHLALI," of London, on Albatross Rock, lat. 34° 17' S., long. 18° 22' E., on 15th September, 1909, whereby loss of life ensued. The British registered steamer "Umhlali," registered tonnage 2144, owners Bullard, King, & Co., master, John Lloyd Richards, left London on the 21st August, 1909, with a general cargo, for Natal. She touched at Las Palmas, and at 10.40 p.m. on the 15th September, 1909, she struck on Albatross Rock, latitude 34° 17' S. and longitude 18°22' E., and became a total wreck. She carried a crew of 71 and 39 passengers. The ship appears to have been well found in every respect. All compasses, books, and charts necessary for navigation were provided. The position at noon on the 15th September, 1909, was latitude 32° 45' S., longitude 17° 6' E., and a course of S. 35 E. true was then set. At 9.10 p.m. a position of latitude 34° 2' S. and longitude 18° 11' E. being ascertained by a four-point bearing off Green Point light abeam bearing N. 55 E., a course of S. 35 E. true was then steered till 9.20 p.m., when Cape Point light was observed bearing S. 40 E. true, and a course of S. 32 E. true was then steered, it being intended to pass Cape Point light 4 miles off, which would bring the ship three-quarters of a mile off Albatross Rock. The chief officer and third officer were on watch from 8 p.m. until the ship struck. The captain after setting the course at 9.10 p.m. was only on deck at intervals, the evidence showing that the evening was passed by him in playing cards in the smoke room. The course laid off was a dangerous one unless a constant check by bearings and soundings was kept, and this course was rendered the more dangerous by the prevailing atmospheric conditions. There was a light haze over the land. No soundings or bearings were taken. Cape Slangkop was observed when abeam; under any circumstances this point would on the course laid down have been passed at a distance of 1 3/4 miles from the five-fathom line. We are of opinion that the conduct of the captain in remaining so long below, in conjunction with the facts above stated, without having given particular orders for the course and position to be checked, amounts to gross negligence. As regards the chief officer, we find that he failed to check the position by bearings or soundings; that he failed to report Cape Point light being obscured; that he did not consult the chart, and that he failed to notice the dangerous proximity of the ship to the land a fact which seems to have been observed by some of the passengers for a considerable period before the ship struck. We are of opinion that his conduct in the navigation of the ship also amounted to gross negligence. We consider that the third officer is also in fault, in that he failed to notice the approach to the land, and in that he failed to show sufficient interest in the navigation of the ship by not visiting the chart room and not observing the courses laid off. After the ship struck the conduct of the captain and officers was admirable. There has been some animadversion upon the conduct of the Lascar crew, but we are satisfied that whatever was done by them was done, not maliciously, but in the instinct of self-preservation. The regrettable incident, loss of one life, a child, does not appear to be due to any neglect or want of precaution on the part of the master or officers, but the result of an accident caused by the sea striking the after end of No. 2 lifeboat, and detaching it from the tackle, while being lowered into the water at midnight. With the above exception all were saved in the boats, which were picked up by the steamer "Galeka," the tug "T. E. Fuller," and fishing boats. Prompt steps were taken at the Port of Cape Town in the despatch of the tug. The abandonment of the ship at about 7 a.m. on the 16th was justified, especially in view of the large quantity of explosives on board. Every effort was made by the captain, officers, and crew to save the effects of passengers and crew; but we think it is to be regretted that more prompt steps were not taken by the agents of the ship on the day after the casualty. It was known in the morning that a tug had left with the object of saving life, but we think that another tug might have been dispatched during the forenoon before the arrival of the crew and passengers in Cape Town, with the object of salving baggage. Subsequent to that date everything possible was done by the agents in this direction. It is regrettable that the Lascars did not disclose at an earlier date that they had valuables on board. This discovery was only made when they were actually being embarked for Natal on Sunday the 19th, and therefore too late to allow of their assisting in their recovery. Since the discovery efforts towards salvage of their effects have been made, but, owing to the weather conditions, without success. We attribute the wreck of the ship to the negligence of the officers above named. We adjudge the certificates of the master and chief officer to be suspended for 12 months, but while we consider the conduct of the third officer to be deserving of severe censure, we are not disposed, under the circumstances, to deal with his certificate. No blame is in any way attributable to any of the other officers. Dated at Cape Town this 27th day of September, 1909.